Pumpkins have appeared everywhere, seemingly overnight. October is prime pumpkin season, and everywhere I look I see them, bins and piles of bright orange squashes. They sit on porches next to mums and bales of hay, waiting to be carved at Halloween. Personally, I prefer my pumpkins un-carved so they can be displayed through Thanksgiving. 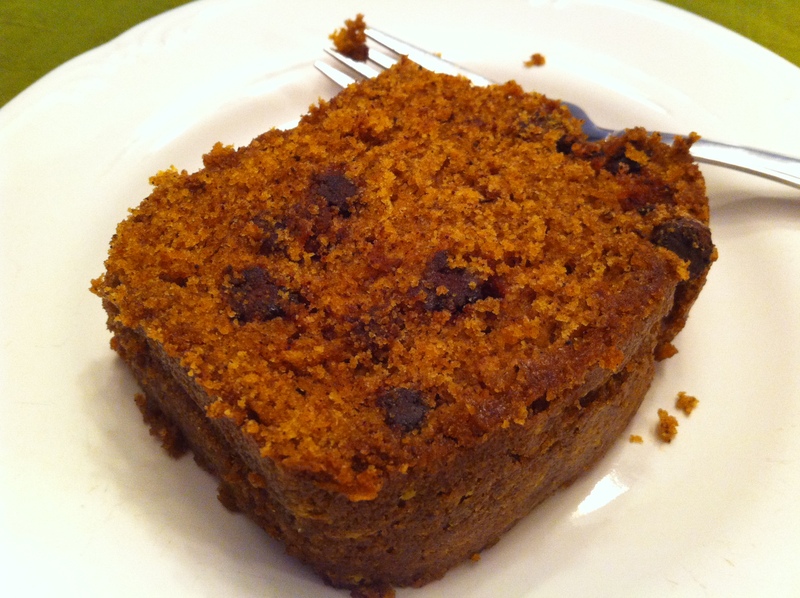 We’ve discussed pumpkin at length on this blog, but I continue to be amazed at how many different variations of pumpkin recipes that exist, particularly on the internet. I found this one one another blog, but tweaked it slightly to make it my own (I increased the amount of spices recommended in the original). It’s a rather large recipe, yielding three 8 x 4 loaves; I used foil loaf pans for them instead of using my regular loaf pans so I could give them as gifts. The original author of the recipe reports that they freeze very well, so they could be made ahead of time and given as holiday gifts. In a very large bowl, mix flours, sugar, baking soda, cinnamon, nutmeg, and salt; set aside. In a large bowl, stir together pumpkin puree, vegetable oil, eggs, and water until very well blended. Stir wet ingredients into dry ingredients, mixing well so that no streaks of dry ingredients remain. Divide batter evenly between three pans; I used a 1/4 cup measuring cup to do this. Bake for 60 minutes, until a cake tester comes out clean. Cool on a wire rack in pans; once completely cool, remove from pans and wrap well in plastic wrap and foil (especially if you’re freezing any loaves). Pumpkins claim a place of honor in fairy tales, folklore, and popular culture unparalleled by other vegetables. Cinderella traveled in style in her pumpkin coach. Jack Skellington, of Nightmare Before Christmas fame, was proclaimed the Pumpkin King. The Headless Horseman hurled a pumpkin in The Legend of Sleepy Hollow. Harry Potter and his friends enjoyed pumpkin juice in the Hogwarts dining hall. Linus missed trick-or-treat fun on Halloween night waiting for the Great Pumpkin to appear—and all that came was a beagle. These whimsical squashes are both cute and tasty, which is likely why we decorate, celebrate holidays, and cook and bake with them. 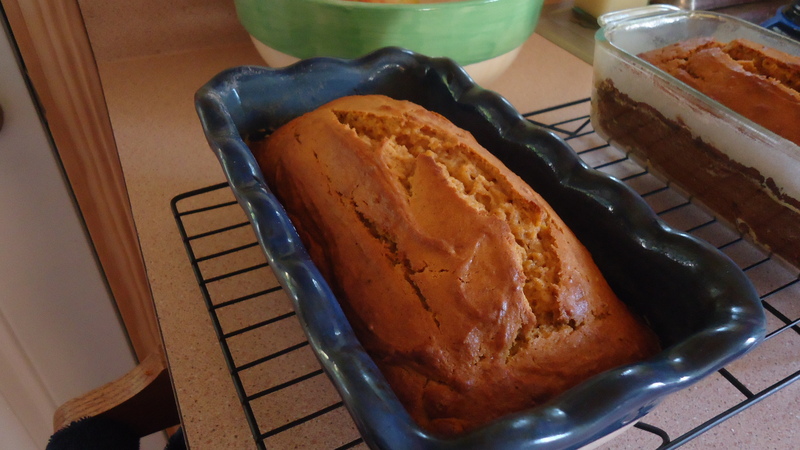 This was my first experience baking pumpkin bread, and I adapted the recipe from another that I found online, substituting cinnamon, nutmeg, and cloves for ginger. Next time, I plan to add chocolate chips to the batter for an extra hint of sweetness and perhaps some toasted pecans for crunch. Once they cool, I may even drizzle them with powdered sugar icing. Grease and flour two 8 x 4 loaf pans; set aside. In a large bowl, combine flour, baking powder, salt, cinnamon, nutmeg, and cloves; mix well. In another large bowl, combine sugar, brown sugar, butter, pumpkin, and eggs; mix well. Add pumpkin mixture to flour mixture and stir until combined. Divide batter evenly between the loaf pans; I used a measuring cup to scoop about three cups of batter into each pan. Bake for 50-60 minutes, until a cake tester comes out clean. You may have to cover the loaves later in baking, after about 45 minutes, to prevent them from over-browning. Cool completely in loaf pans. Drizzle with powdered sugar icing if desired; combine two cups sifted powdered sugar with one teaspoon vanilla extract and one to two tablespoons of water until you reach a drizzly consistency, then pour over loaves.